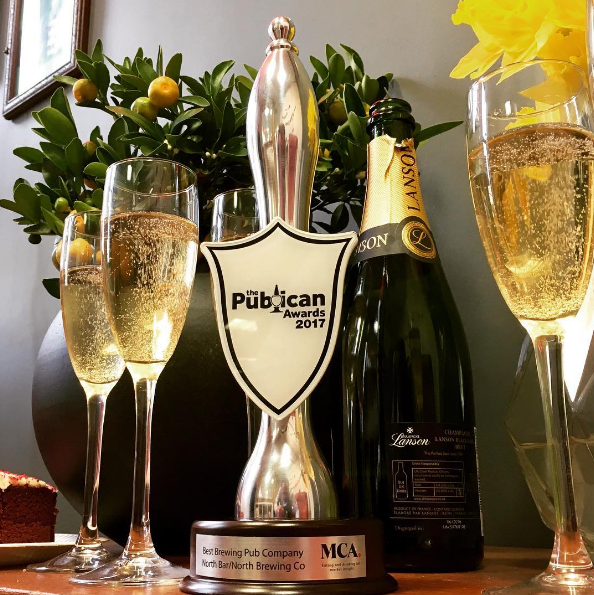 On Tuesday 14th March, our minds were blown when North Brewing Co and the North Bar group won “Best Brewing Pub Company” in the Morning Advertiser Publican Awards 2017. We’re absolutely delighted by what we’ve achieved with the brewery so far and we feel we’ve done the North Bar name proud. We’ve worked spectacularly hard to make sure that the brewery lived up to the reputation for fantastic quality and service that we’ve built over the last 20 years. And with the upcoming celebrations for the flagship North Bar’s 20th birthday, the timing couldn’t have been better! A huge thank you goes to fellow nominees, Laine’s Pub Company and Dark Star Brewing Company – We were honoured to share a category with such great people, and we were grateful to have such brilliant company on our table at the ceremony! And apologies for any expletives which may have been heard across the room upon the announcement being made – we were quite delightfully surprised to say the least!